I distinctly remember being told (more times than I can count) that everything would change when I had a baby. I’ve gotten a lot of gifts from being a mom. And one of them is that I finally figured out what I wanted to be when I grow up. Don’t get me wrong I was already a therapist, and had wanted to be a therapist since as long as I could remember. But when I became a mother, I finally figured out what direction my practice would go. I finally figured out what really got me excited. What made me want to go to work, if I was leaving my sweet babies at home. It was early into motherhood that I realized just how hard it was. The toll it was taking on my relationship. The toll it was taking on me. I am so grateful to have such a supportive family, wonderful friends, fabulous colleagues, and of course my own therapist, that helped me through this transition…this ongoing transition. It was through my own challenges that sought me to seek out more training with the Gottman Institute’s, Bringing Baby Home Program and then led me to more specialized training in Perinatal Mental Health through Postpartum Support International and the 2020 Mom project. I love my work! I love the people I get to work with! I love the people I’ve met with similar passions! Helping new parents handle the transition to life with baby, as smooth & happy as possible. So honestly, after having a child it did not surprise me that 15 to 20% of mothers experience significant depression or anxiety while pregnant and/or after the birth of their baby. And even approximately 10% of new fathers will as well, with up to 50% of fathers who’s partner is struggling. But the thing to remember is, you are not alone, help is available, this is temporary, and you will get better! 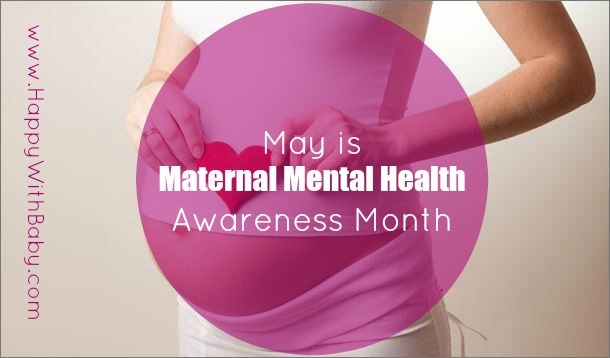 So since it is May is Maternal Mental Health Awareness month I will be hosting some fabulous professionals on my site throughout the month. It’s going to be a busy month here and I have lots of fun things in store for you. I want to promote a place of encouragement, caring, and support. Because being a parent is hard. Being a mom is hard. But with support it is so much better. Remember if you are struggling, please don’t wait to get help. The sooner you do the sooner you can start feeling better. Please check www.postpartum.com for resources in your area or feel free to reach out to me. I would love to help guide you in the right direction.